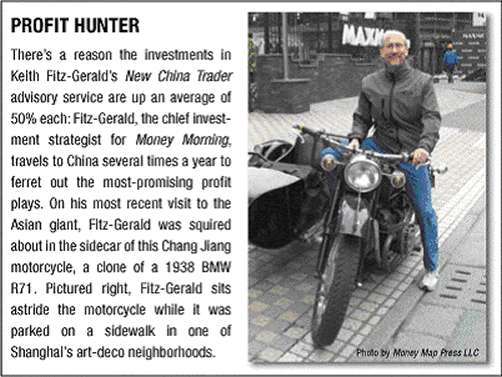 Keith Fitz-Gerald writes:SHANGHAI, The People's Republic of China - Given what you may have heard about Chinese property values in recent months, it may surprise you to learn that Chinese real estate investors are extremely value oriented. And so are the institutional investors I've run into during my latest investment-research visit to this country. These institutional players want to lock up some valuable land parcels before 2020. That's the date by which 500 million Chinese citizens are expected to have moved into China's cities as part of the greatest urban migration ever recorded. You can do the math: We're talking about a group that's 1.6 times the entire U.S. population ... moving from China's countryside to its cities in the next 10 years. The Mass Migration "Big Bang"
A population shift of this magnitude can't help but be a major catalyst for increasing real estate values - especially in such top-tier cities as Beijing and Shanghai, where I am as I write this. This massive urbanization will also significantly shift the market dynamics of second-tier municipalities - such as Chongqing, where literally millions of people are pouring in from the countryside. Some pundits, such as noted short-seller Jim Chanos, say this is already happening. Back in January, citing the vacancies that pepper the cities I've just named and the flood of speculative capital he says has washed through them, Chanos quipped that China is "Dubai times 1,000," - a sound-bite that's kept him in the media spotlight ever since. Personally, I find that more than a little ironic considering he's never even set foot in China and didn't even begin studying China until last summer, critics say. To hear Chanos and others talk about their concerns about a Chinese economic bubble, you'd think Chinese real estate developers and investors are essentially playing with M onopoly money. My experience suggests otherwise. So does some of the latest market data that I've reviewed. One study, for instance, suggests that Chinese real estate has underperformed the benchmark MSCI China Index by nearly 30%. The point is that Chinese real estate, on the whole, appears to be significantly undervalued - even at this stage of the game - when compared to regional alternatives in Hong Kong and Singapore, two other Asian markets that are a lot further along on the economic-development curve. The bottom line - and the point that I keep coming back to - is this: If China's real-estate market is as far out of whack as some people suggest based on vacancies, property-related prices should be falling - even cratering. In fact, they're rising - and so is overall growth. Just yesterday (Thursday), in fact, China announced first-quarter gross-domestic-product (GDP) growth of 11.9%, the country's fastest expansion in nearly three years and a rate that was faster than what analysts were expecting. China's economy had advanced at a 10.9% pace in the final quarter of last year. Stephen Green, head of Greater China research for Standard Chartered PLC (PINK: SCBFF) here in Shanghai, told MarketWatch.com that central planners in Beijing could be faced with an asset-price bubble in the second half of the year that could trigger a sharp credit contraction in 2011 - unless they're able to throttle growth back to a more sustainable pace. "There are signs of overheating," Green said in the interview. Beijing is well aware of the stakes and is taking steps to manage China's growth - with some signs of success. As part of yesterday's report on economic growth, Beijing said that March's consumer price index (CPI) for China was 2.4% higher than a year earlier. That was down from the 2.7% increase in February, and is below the 2.6% increase that surveys by both Dow Jones Newswires and Reuters showed analysts were expecting. In the real-estate realm, Beijing is raising reserve requirements for lenders, is tightening up on permits and construction licenses, and is even taking steps to halt illegal development. In some parts of China, local developers will often construct entire buildings and never pull a permit. As incomes increase and China's consumer class continues to emerge, such pastimes as golf become all the rage. One result: Even though golf courses aren't exactly easy to hide, there may be hundreds of illegal links operating throughout China right now, the China Daily reported in a story that I read during my visit here. If the markets were as overbuilt as some pundits allege, there wouldn't be any competition for the best properties. Instead, that competition is as fierce as I've ever seen it - an observation that was seconded by many of the private-equity investors I talked with at the Halter Financial Summit that I attended in Shanghai. Like me, these folks have been actively investing in the Asian markets for decades. There's a very clear trend developing. As the property prices in Beijing and Shanghai increase in expense, many companies, investors and developers are shifting their focus to the second- and third-tier cities that have yet to experience the urbanization rush of their much-larger first-tier counterparts. That's going to broaden the overall advance, creating a more-sustainable environment for real estate investing and development even if major pockets of urban overvaluation exist today. It's precisely the pattern we described and told Money Morning readers to expect several years ago. The speculative excesses that do exist appear to be limited to very-high-end residential real estate (read that to mean ultra-luxury real estate) in the primary cities. Over -speculation hasn't meaningfully impacted the commercial-real-estate sector, or the more-mainstream housing sectors, although that could still happen . Residential projects aimed at the emerging consumer class, as well as the business-related real estate projects that are so important to a nation's economic advance, both remain in the realm of "investments" - and not speculation - which is why they continue to have very clear government support as part of central planning objectives and China's ongoing growth. In other words, Beijing is willing to let the "Ferrari set" flame out, but clearly wants the middle class to succeed because that group's emergence will create a foundation for both social and economic stability. No wonder the enlightened institutional investors that I've talked with here in China continue to be optimistic. They understand that they could sit on the sidelines and wait for the corrections that periodically come along. But these investors also know that the "bottom" of the next correction could easily be represented by much higher than the prices we're seeing today - and probably will be. If you're actually "on the ground" here, and have enough money and the ability to do your own due diligence - or "DD" as the Chinese call it - you can begin hunting in the second- and third-tier cities, right alongside everybody else headed that direction. There's certainly money to be made there in private equity. For U.S.-based investors, however, there's a much-easier way to participate. Consider investing in one of a handful of exchange-traded funds (ETFs) that offer exposure to China's real-estate market - such as the Claymore/Alpha Shares China Real Estate ETF (NYSE: TAO) and the Claymore Alpha Shares China All-Cap Fund (NYSE: YAO). The first fund concentrates specifically on real estate, while the second fund is more broadly diversified and includes banking, construction companies and developers. A more generalized alternative is the iShares FTSE NAREIT Asia ETF (NYSE: IFAS), which is a regional play that has approximately 8% to 10% of its holdings allocated to Chinese real estate. There are also several closed-end funds that offer a similar, generalized exposure, including the RMR Asia Pacific Real Estate Fund (AMEX: RAP). As you incorporate this sector into your overall investment strategy, it's important to keep in mind the general advice that I use as part of my own portfolio strategy for China. The Asian giant remains the biggest wealth-creation opportunity of our lifetime - in the long run. In the near term, you be certain there will be volatility, periodic pullbacks and even corrections. And while the real-estate sector offers some of the best long-term appreciation of any China-oriented investment category, the investments I've just mentioned are all trading near to the tops of their 52-week ranges. And that means they could be poised for a short-term pull back just as easily as a long-term breakout. Position any investments accordingly.